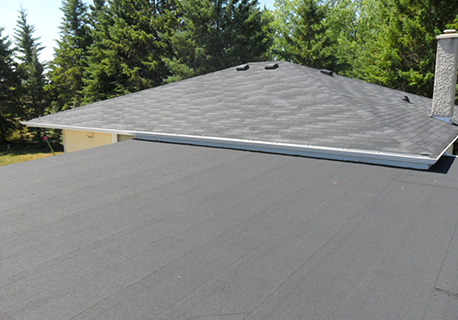 Flat roof systems | Roof Replacement specialist In South Etobicoke, Mississauga, Oakville, Burlington, Milton. Roofs on Homes works closely with you to get the proper roofing system for your building according to your requirements and budget. We listen to your concerns Clarify all your roof options providing you with an evaluation of your roof to make the best decision for your business. We Co-Ordinate with our customers to plan and schedule required work to be preformed, providing as little disruption to your business as possible. Installations are completed promptly and on budget. Call for your roof inspection today, we invite you to contact us at 416-676-7655 or by filling out the contact us form and one of our representatives will be in touch with you shortly. Our Team of skilled installers have the experience and training to set up a quality roof system that works for our clients needs. Our years of experience and skilled certified installers will be able to ensure quality workmanship and products giving you the best desired outcome for your roofing needs. You should have comfort and peace of mind that your roofing system will be completed professionally and according to our manufactures installation procedures and practices. Flat roofs if properly installed can last 10 -30 years, if they are poorly constructed or simply neglected, problems will start immediately. Leaks are most common of those problems. Flashings around roofs protrusions, like Chimneys, Vents, Cones, Pipes, A/C Units and Skylights are most vulnerable to cause leaks. Roofs on Homes have provided Emergency Flat Roof Repairs through out our community helping business and homeowners with real long-term roofing solutions. Contact us any time and one of our representatives will schedule you in.